1 England and Wales, Civil Registration Birth Index, 1916-2007, Birth record for Deborah J. Catesby, Ancestry.com (Online Database). 2 England and Wales, Civil Registration Marriage Index, 1916-2005, Marriage record for David R Harington and Deborah J Catesby, Ancestry.com (Online Database). 3 Mosley, Charles, editor, Burke's Peerage and Baronetage, 106th edition, Crans, Switzerland: Burke's Peerage (Genealogical Books) Ltd. (1999), 1317. 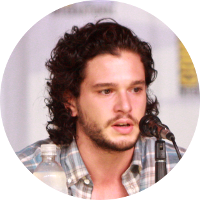 4 Wikipedia, "Kit Harington", (accessed 10/17/2017).